Did you try the hair chalking? I really like it. Turns out pretty cool. I love the color you chose for his hair. This is really cool! My kids would love to do this. Love love love! I wish our school did fun stuff like that for the kiddos! So cute! How fun. It looks great. We homeschool but I have been debating doing things like this in our normal days. It could still be fun! Yes, you should still do it one day. I plan on homeschooling my son through middle school and I plan on doing things like this from time to time. Love it! My son used to do fun stuff like that with his hair! Ya know, that is really cute on him and makes me want to go out and multi color my hair, but I think my husband would tell me to knock it off! LOL! Now that is a fun hairdo! Clearly you are a COOL mom! The chalk does work great on my daughter hair. I like it because it washes out real easy and is cheap to do. This is so cute in purple too. Boy, I bet he had fun! Love it! My hubby and I have had tons of fun with various hair colors over the years. One of the nice things about our professions! i love this colorful hair trend thats been going around lately. i heard it helps to use hairspray after applying the temp color. My mom would never let me do stuff like this but I plan on letting my son “rock” out every now and then with some fun hair. I can tell he loves it! That looks like my daughters hair (but shorter) when we did the hair chalks. I love those things but the package says to get it wet and it works better dry, in my humble opinion. We used temporary colors from an aerosol cans. And it washed right out that evening. I haven’t tried chalk, yet, but definitely will give it a try. I used to do that when I was a kid. Now I dye it crazy colors for real! Crazy hair day is always a hit around here! How fun! Wish the boys had this at their school. Totally love it! 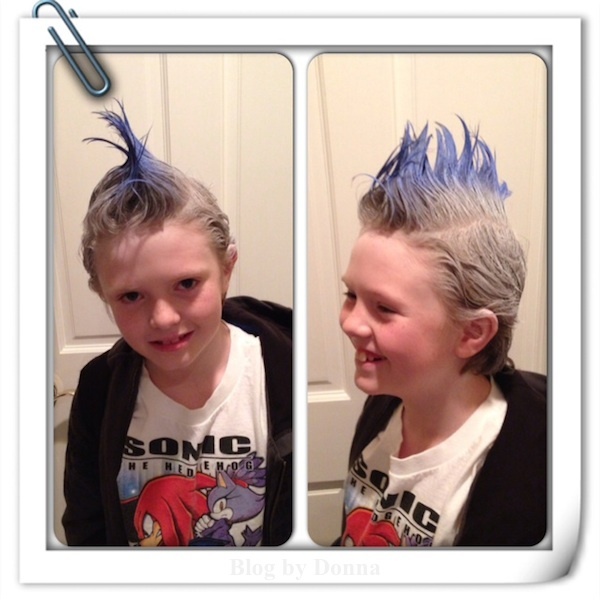 I love to have fun with my son’s hair from time to time.